The CEO of Nintendo America said that the impact of Holiday sales is more important for his company than for other console manufacturers. For many videogame companies, how your hardware and games perform during the Holidays can make or break your year. In fact, many companies jigger their fiscal calendars so that the Holiday sales are completely tabulated before the taxman comes knocking. But as Reggie Fils Aime, the public face of Nintendo here in America, said to investors at the BMO Capital Markets Annual Digital Entertainment Conference in New York yesterday, holiday gift-giving means a lot more for his family-oriented brand. "The holidays are more important to Nintendo than to other manufacturers," said Fils-Aime. "We have a distinct edge when it comes to gift-giving, and it's no doubt because of the familiarity and recognition of both our brand and key franchises." Fifty percent of all Nintendo's hardware sales in 2009 were purchased in November and December. "For everyone else that number was just over 40 percent," he said. "The disparity on the software side is even greater," Fils-Aime went on. "For Nintendo platforms, 44 percent of all game sales came during November and December. For the rest of the industry, that number was only 33 percent." He expects the same thing to happen this year with hefty sales predictions for games like Donkey Kong Country Returns and Disney Epic Mickey for the Wii and Golden Sun on the DS. Despite lagging sales of the Wii, Fils-Aime seems confident the brand will have a successful season, and hopes that Nintendo will have more cause to celebrate than the 25th Birthday of Super Mario Bros.
"The Nintendo difference continues to attract new consumers. 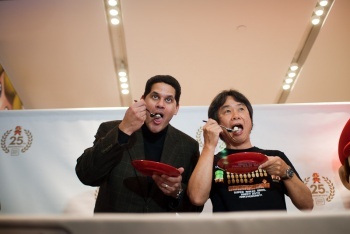 For us at Nintendo, it's full speed ahead," said Fils-Aime.